Do you know what an アルパカ (alpaca) is? It’s a South American animal that looks alot like a llama. They also look kinda similar to that giant flying doglike character in the ’80s movie “The Never Ending Story“. 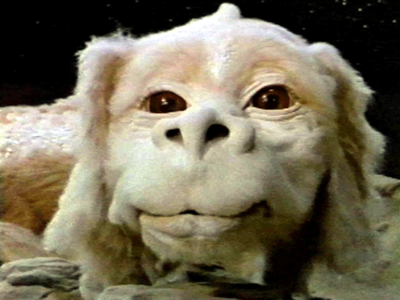 From the movie "The Never Ending Story". Earlier this year, 「上野動物園」 (Ueno Zoo) in Tokyo got a brown female アルパカ (alpaca) named 「モコ」 (“Moko“). 「モコちゃん」 (“Moko“) was alone, so a few weeks ago 「上野動物園」 (Ueno Zoo) got another female アルパカ (alpaca) to live in the same pen as 「モコ」 (“Moko“). This new アルパカ (alpaca) is white. The zoo asked the public to vote on a name for this new アルパカ (alpaca). So 「モコ」 (Moko)’s new roommate is 「灯」 (Akari)…it means “light” (as opposed to “dark”). アルパカ (alpaca) are kinda cute, don’t you think? If you want to see them, you can visit them at 「上野動物園」 (Ueno Zoo) in Tokyo.